Aerial View showing the "Fishing barge" jutting into the water, which was inspired by the historic docks that once extended from the riverbank. The Play and picnic terraces allow an unparalleled view of the Detroit River and Ambassador Bridge - spaces for family gatherings, children's play, and leisurely strolls. 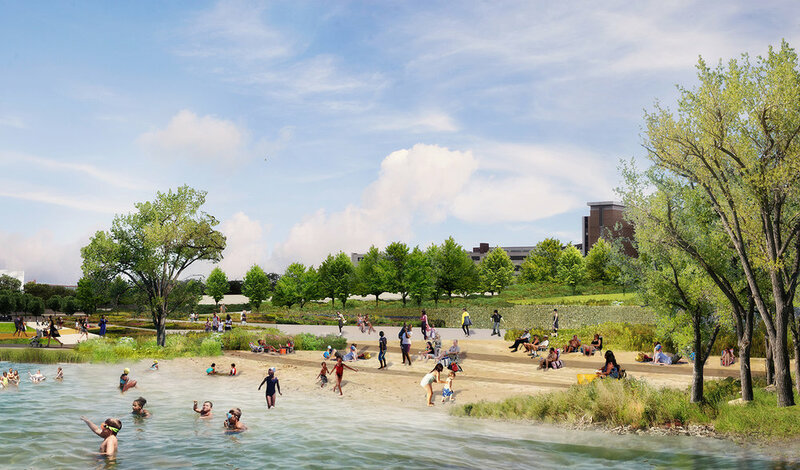 The "riverbank" and "may's creek beach" provide equitable access to the river for all Detroiters and connects to Detroit's International Riverwalk. The "Grand Stair" provides opportunity for fitness, lounging, people watching, performance, urban activity and an opportunity to climb to see the incredible view. The "Horizon Line" gives park visitors a unique perspective of the river, as well as an area for dog walking, running, fishing, people watching, rollerblading, biking and kid's play. "May’s Creek Garden" highlights native Michigan plants, provides a connection to the future greenway, and celebrates the historic creek that once existed near the park in a relaxing, lush environment. "Jefferson Bowl" is a flexible space for teen activities, quiet people watching, or a pop-up fitness class. The "Meeting Place" and adjacent "Warming hut" provide a wintery opportunity to sit by the river while being shielded from the cold or warmed by winter fires. In the warmer months, the "meeting place" becomes an active water play area for all ages. Shade trees nearby accommodate a relaxing day in the park. The “Great Lawn” provides area for relaxation, dog play, frisbee and can also accommodate celebrations and musical performances. In winter visitors can enjoy sledding or cross-country skiing. ‪On February 8, GGN presented as one of the four finalist design teams who were asked to envision the future of West Riverfront Park.The West Riverfront Park Design Competition was announced in June of last year, and has since drawn interest nationally and internationally from leading landscape architects and design professionals. 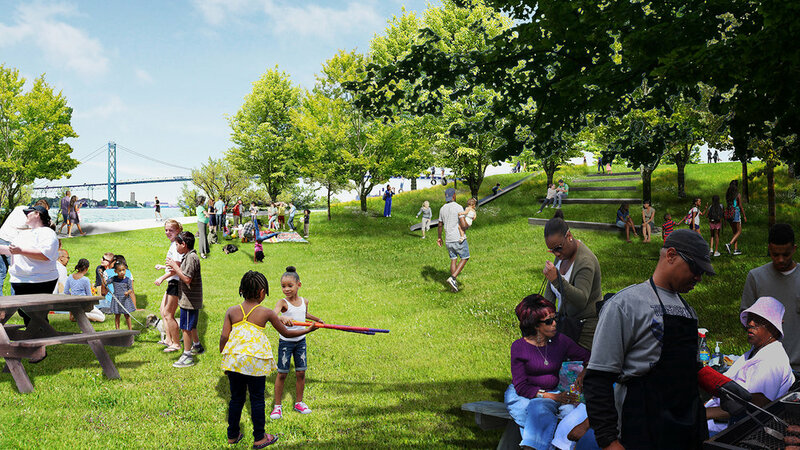 The West Riverfront Park Design Competition incorporates a unique community-led design process in which the public has been encouraged to share their ideas and input all throughout the project. In addition to hosting several community meetings, the Conservancy assembled a Community Advisory Team (CAT) made up of every-day Detroiters who visited public places in world-class cities like Chicago, New York and Philadelphia so that they could report back on their experiences. CAT members will be on hand to engage with visitors when the public gets another chance to see the renderings and models during a public exhibition from February 10- 22. The exhibition takes place from 11 a.m. to 8 p.m. at 1001 Woodward in downtown Detroit. Detroit is a city celebrated for dreaming big. In the Woodward Plan’s grand diagonals, the bold lines of industries that lead the world, and the outstretched arms of Marshall Fredericks’ sculpture, there is a scale and strength throughout Detroit.GGN's "Crossing Ground" design for the Detroit West Riverfront Park celebrates this spirit by marking a bold new figure between the City and the River. This site anchor invites Detroiters to step out of the daily city and elevate their experience to new horizons and dreams. Great public spaces become celebrated as icons of their cities. But their real greatness lies in providing a place where differences can meet. We each arrive with our own reasons but are quickly reminded that we are not alone. Such shared experiences challenge us to expand our understanding of ourselves and others, shaping the way we see the world around us.During a recent salon discussion in Detroit, one Southwest leader voiced a “fearful excitement” for the future of the West Riverfront Park. That sentiment expanded as hope for all the park could offer, but apprehension that an intangible “something” sustained by generations of Detroiters could be lost. 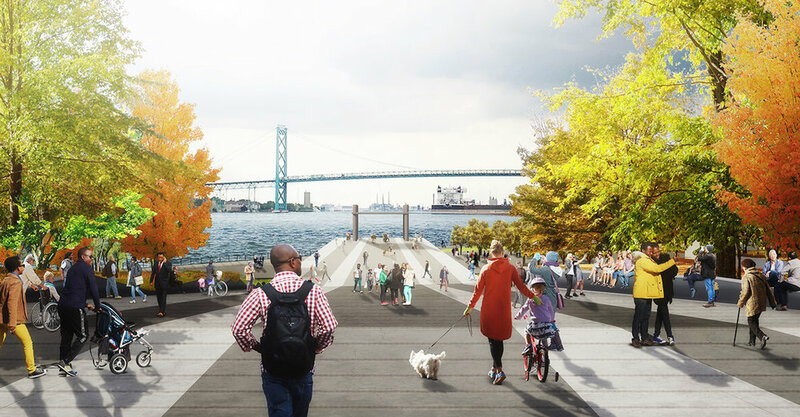 Our "Crossing Ground" proposal for the West Riverfront Park intersects Detroit’s People, Land, and Spirit to establish a new topography where the many stories of this place can meet. It is a park where the City meets the River, West Detroit meets East Detroit, New Detroit meets Old Detroit, and all residents have a space to dream big and make the city they know and love into a stronger tomorrow. Crossing Ground looks to the richness of these many threads and establishes a new ground for connecting them together. A place that is accessible and welcoming to all, this park puts people at the center where a celebration of the lives of Detroiters are the real attraction. Read more about this exciting competition in the following articles. The winning design team will be chosen mid-March 2018.Public input is an important part of this competition process. Be sure to peruse the lively comment streams for each of these articles.